My garage is full of potatoes. And onions. And two kohlrabi. And a few other things that wouldn't fit in the fridge. Let's not even discuss the fridge. It's quite full. The carrots are crowding the oversized turnips and the peppers have overtaken the fruit crisper. You see, yesterday we went to Miller Farms in Platteville, Colorado. It seemed like we needed a fall family adventure, and I'd heard Miller Farms was a good place to have just that. 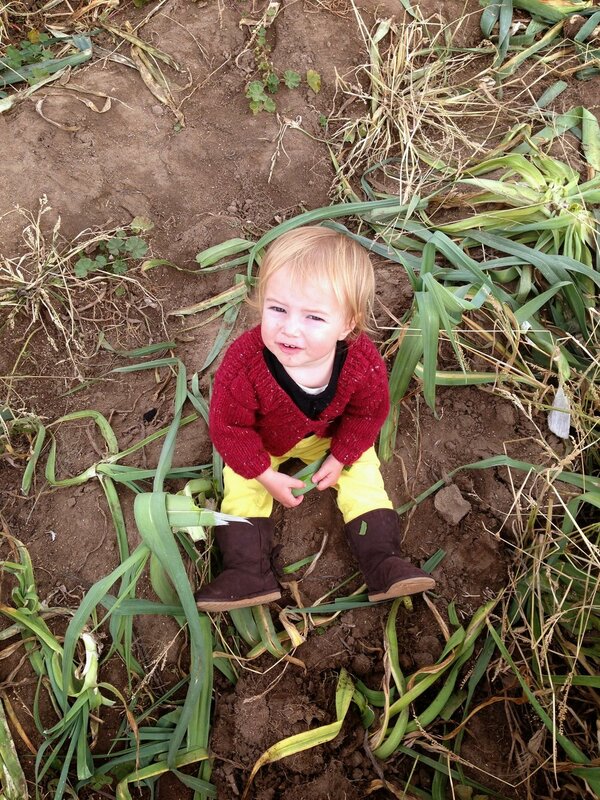 Plus, it is halfway between Denver and Fort Collins, so Nana met us there for a day of farming fun! But I have to say, when we first pulled into the parking lot and saw a giant wooden Sponge Bob Square Pants next to a bouncy house, I wanted to leave. I was looking for the pumpkins and produce, not gimmicks. Why on earth does Sponge Bob need to be at a farm? Can't kids just enjoy farm stuff at a farm? Anyway. We didn't leave. We paid our $15 per adult admission and made our way in. Willa fed the goats and we tooled around in some miniature tractor bicycles before loading ourselves onto the tractor-pulled hayride for the real deal. Our ride took us to several stops around the farm where we were able to get off and pick our own produce. Our first stop was onions. Getting down from the wagon, I had no idea what we were picking. It just looked like semi-dry dirt fields. But as I got closer, I saw onions, nestled in the ground. Of course onions grow in the ground. I knew that. I'd just never seen it. And boy was I excited. It sounds a bit absurd to say it was a hard day's work, but all the fun and learning really was kind of exhausting. After picking all our produce we had to haul it back to the cars (warning: there's a mad dash for wagons when the hayride ends! ), and then once home it required a lot of cleaning and sorting (and many curses at Denver Public Works for not yet having city-wide compost collection).